Before they graduate from Missouri S&T, students in the mechanical engineering program must take, and pass, ME 261, otherwise known as ME Senior Design. The premise of the course is simple. Representatives from various industries present the department with a problem and a team of students spends the semester trying to solve it. Often the end result is a spring or a bolt — something that becomes a component of a larger piece of machinery. But sometimes the end result is more complex — like a pumpkin-chucking trebuchet. “Sometimes engineering problems are fun,” says Brandon Cundiff, a 2012 mechanical engineering graduate and leader of the team assigned to Pete’s Pumpkin Patch. 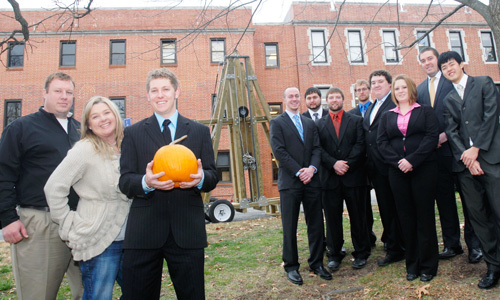 The group designed and built a floating-arm trebuchet capable of tossing a pumpkin up to 150 yards. Among the challenges the students encountered while building the 13-foot-tall contraption was dealing with numerous parts and the calculations required to make them all work together. Everything had to be square and there were no “do-overs.” It involved plenty of trips to the local home improvement store. 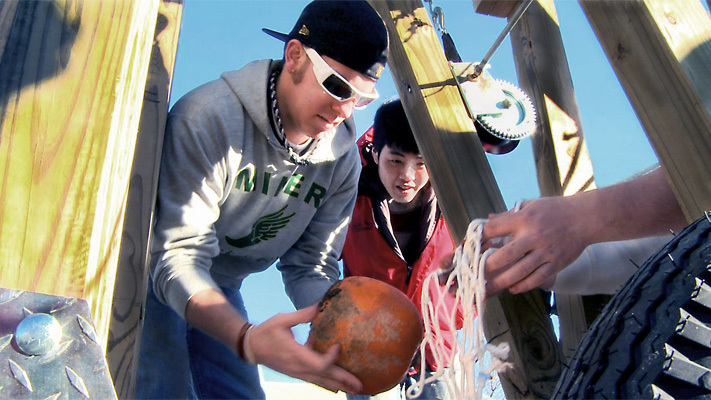 Success in the sport of pumpkin chucking is often determined by distance — the farthest pumpkin chucked wins. In this case, however, the goal is entertainment value. “Part of the fun is seeing the pumpkin smash as it hits the ground,” says Tara Peters, who owns Pete’s Pumpkin Patch with her husband, Chris. Open in the fall, the couple’s pumpkin patch features family activities like a corn maze, a hay tower obstacle course, wagon rides and a petting zoo. 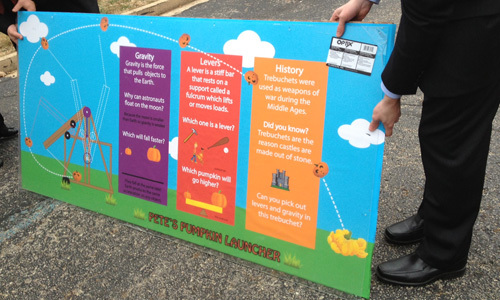 Kids will be able to check out the trebuchet when it makes its debut at Pete’s Pumpkin Patch this fall. Celebrate National Engineers Week Feb. 17-23.